You really do need the recipe, don’t you think? This is another recipe from my Mom’s recipe box. Much like her banana bread and snowball recipe, this one is sure to be a keeper. I was rifling through her recipe box looking for nuggets of gold when I came upon this cookie recipe. Fast forward a year, and she was doing the same thing and texted it to me. It was finally time for me to try them! So…what makes them the World’s Best Cookies? So many things! I think that the first (and most important) standard for any cookie is taste. These have a taste that’s hard to describe; kind of like a non-chocolate chocolate chip cookie and a pecan sandie, all rolled into one. The other requirement for any cookie, in my book, is a chewy texture with a crisp outside but soft and gooey inside, and this cookie is most certainly that. So many factors go into making this cookie all of those things and one of them are all the ingredients inside. I also like to call these “kitchen sink cookies” because seriously, when I read the ingredient list I was amazed at all the components. Sure, I’ve put oats and butter in cookies (haven’t we all?) But what about cornflakes? And nuts and coconut…and oil? I know – this recipe has not only butter but oil too. It has brown sugar and granulated sugar. And flour and oats…and all sorts of mix-ins. I have no idea where this recipe originated or what it was originally called but World’s Best Cookie Recipe is definitely on the list. I am pretty sure this cookie hails from the 70s. Only in that era would people think to add butter and oil to a recipe and call it good, am I right? Plus…cornflakes were a huge thing back in the day. Now…does anyone eat cornflakes anymore? Or are the just purchased to coat chicken or make cornflake cookies? I know that’s the only reason I buy them…except when I’m craving plain cereal with sugar. 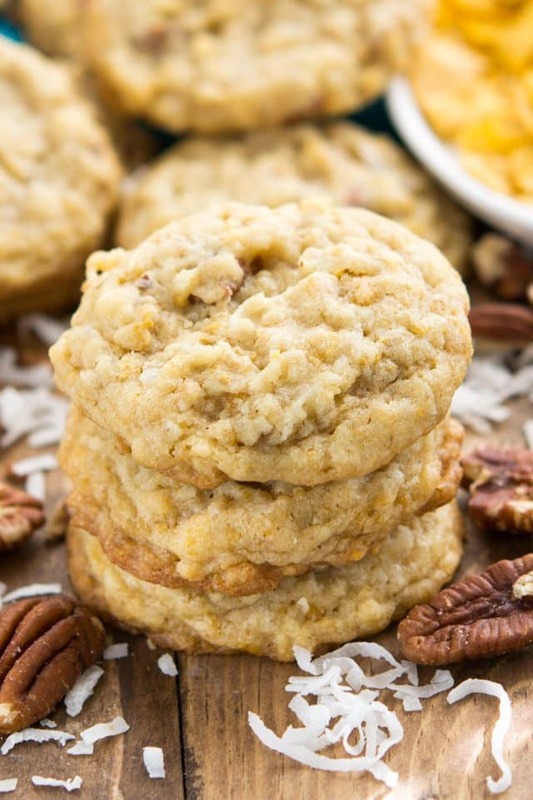 These cookies are soft and chewy, crunchy and gooey and SO FULL of delicious flavor. When I find recipes like this I wonder where they went. Why aren’t these on bakery shelves and all over the internet? I’d choose these over chocolate chip cookies any day of the week! IF YOU’RE LOOKING FOR THE WORLD’S BEST COOKIES RECIPE, LOOK NO FURTHER. THESE COOKIES ARE FULL OF BUTTER, OIL, SUGAR, CORNFLAKES, COCONUT, PECANS, AND OATS AND REALLY ARE THE BEST TASTING COOKIE I’VE EVER HAD. Oil and butter…yes BOTH! For me, butter is essential in cookies. It provides not only flavor but that telltale chewy texture a good cookie has. But, as I discovered with my favorite shortbread cookie recipe, adding oil along with butter makes them chewy and soft at the same time. Weird, but true. Granulated and brown sugar. Granulated is the regular go-to for cookies because it helps with crunch and spread. Brown sugar helps with softness, so adding both ensures a nice soft cookie. Oatmeal: adding oats to a cookie adds to the chewiness. 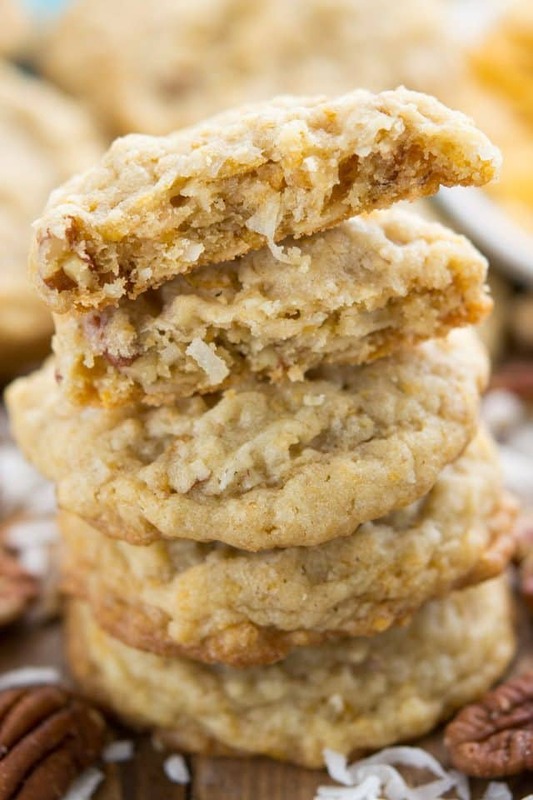 These are by no means oatmeal cookies, but the oats add a good chew. 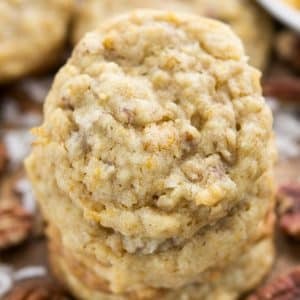 If you don’t have quick cooking oats you can make your own by adding old-fashioned oats to a food processor or blender and pulsing a few times. Cornflakes – bring on the 70s! Adding cereal to cookies isn’t knew to me (um, Fruity Pebbles Cookies, anyone?) and I love adding cereal for texture and crunch. Coconut – you can skip if you don’t love it, but you don’t 100% taste it, it’s more for texture. Nuts – use walnuts or pecans or your favorite nut. Great for flavor and texture. 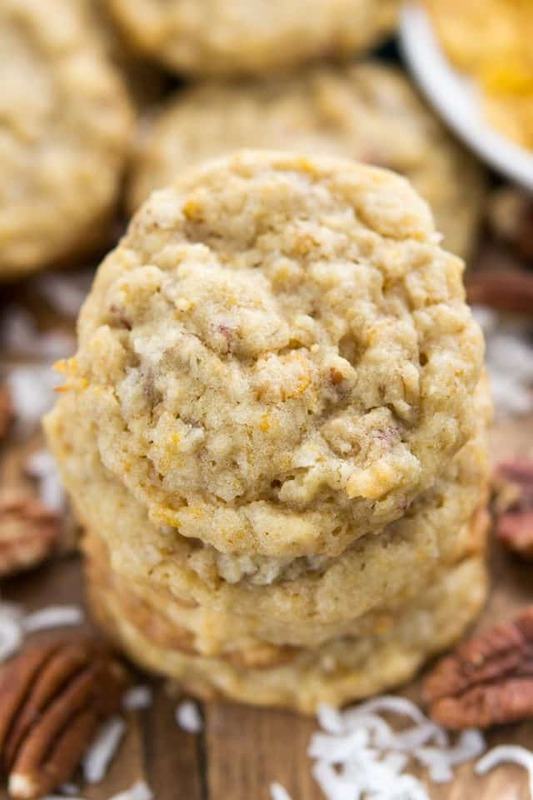 I used pecans, which is why I suspect I tasted Pecan Sandie in these cookies. As usual, I like to chill my cookies before baking to let the flavors meld. Plan accordingly! Now, there is no chocolate in these cookies and I don’t miss it one bit…but you can add 1 cup of chocolate chips if you want. That would make them the World’s Best Cookies x1000!! This recipe makes about 4 dozen cookies, depending on size. They freeze well too, so you can save them for later! Let me know if you remember these cookies. I was too young back in the 70s…but I’d love to hear if they were really a thing! These really are the WORLD'S BEST COOKIES! I couldn't believe how good they were when I tried them! Cream butter and sugars in the bowl of a stand mixer fitted with the paddle attachment. Cream until light and fluffy. You can also use a hand mixer. Add oil and stir until smooth. Add egg and vanilla, mix until smooth, then stir in the salt and baking soda. Mix in oats and flour until just mixed. Stir in coconut, nuts, and cornflakes. Preheat oven to 350°F. Line cookie sheets with parchment paper or silpat baking mats. Place cookies 2” apart on prepared cookie sheets. Lightly press down with the palm of your hand. Bake for 9-11 minutes or until the bottoms just start to turn golden brown. Cool at least 5 minutes on cookie sheet before removing to rack to cool completely. Store in an airtight container for up to 5 days or freeze for up to 1 month. 0 Response to "The World's Best Cookies"